Chinese President Xi Jinping has met with his Russian counterpart Vladimir Putin for talks in Vladivostock on the sidelines of the Eastern Economic Forum. Both has said they believe bilateral ties are entering an era of faster and higher level development, and agreed to resolutely develop their relationship and maintain world peace and stability. President Xi said both countries should further integrate the Belt and Road initiative and the Eurasian Economic Union as well as expands cooperation regarding energy, scientific and technological innovation, agriculture and finance. Xi Jinping believed the forum will bring new opportunities to regional cooperation. He stressed that as permanent members of the UN Security Council both China and Russia should enhance communication in international and regional issues and fight against unilateralism and protectionism. 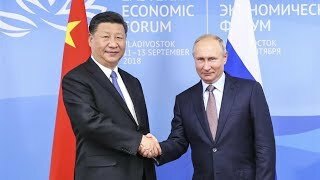 Putin welcomed president Xi's attendance to the forum saying the close contact between them demonstrate the high-level ties between the two countries. He vowed more cooperation with China regarding investments, e-commerce and people-to-people exchanges. Xi Jinping and Vladimir Putin have also participated in a gathering involving regional leaders from both countries. Regional cooperation was one of the main topics discussed by both leaders in Vladivostok. Officials have revealed the outcomes and agreed to expands the range of cooperation. The two leaders also witnessed the signing of multiple agreements and held a joint press conference afterwards. She gave her reaction to his release at a press conference.